Our #WednesdayWrite is a little different this week. It’s that time of the semester when all your teachers beg you to complete the SPOT survey, and I want to tell you a little bit about how we use your feedback in my department. I use your feedback to figure out if the course is giving you what you need. I take your suggestions into account as I set up my classes in the future. 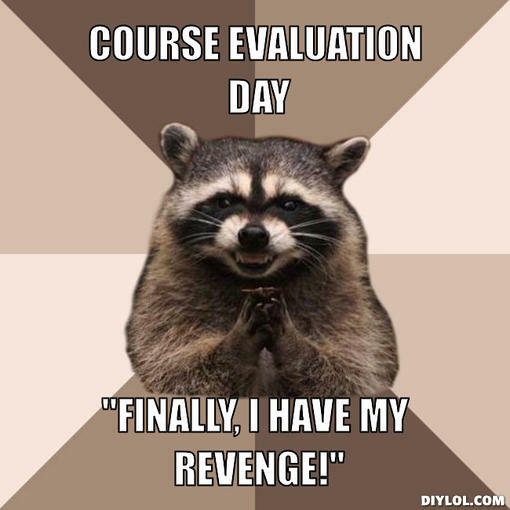 My department uses your feedback as part of the system that is used to evaluate how well I am doing as your teacher. Both the survey answers and the comments that you make are read by others in the department to provide annual review feedback to me each year. Most (but not all) departments on campus use a similar system. Give concrete details. Use a specific example or two to help me understand your comments. Instead of saying, “This class taught me a lot,” say what the class taught you a lot about; or instead of saying, “I wish this class covered more,” say what kinds of things you wish the class had covered. Think of your feedback as continuing the conversation. You have been sharing resources on Facebook and adding comments on the course blog. Adding comments on the SPOT evaluation is just another way to continue telling me about what you are learning and thinking about the course. I am really interested in hearing what you have to say. Just be honest, and tell me what you think. Let me know how you feel about the course policies. I care a lot about making the course fair for everyone. I know you all have other classes and obligations, so I have tried to set up the course in a way that makes it fair and easy for everyone to do well. That is why I have the grace period and the infinite revision system, for instance. Did these policies seem fair to your? Do you have suggestions? Let me know. Remember that your feedback is anonymous and that I will not see it until AFTER course grades have been submitted, so there is no way that your feedback can influence your grade. You can include completion of the SPOT survey as evidence of your work to earn a grade higher than B. State that you completed the survey in your final. Include a screenshot if you have one as evidence. If you don’t, no worries. All work in this course is covered by the Honor Code, so lying about the survey would be a violation. Once you have completed your SPOT survey, add a comment here that says, “Done.” That’s all you have to say today. Feel free to say more if you want.